It's the most wonderful time of the year... Yes, friends, it's Girl Scout Cookie Season. I know, without a doubt, that some of you just said to yourself "Oh, no. Keep those things away from me." But if you're really honest with that little voice in your head, you love these cookies. You want these cookies. These cookies have become an American pastime. And frankly there are some who would go so far as to say it's downright Un-American not to buy them. 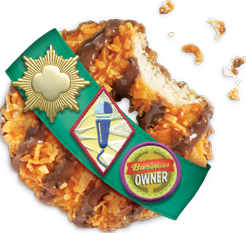 Seriously, did you know that the Girl Scout cookie sale is the largest girl-led business in the world? And it's truly a business. The girls learn valuable skills regarding how to handle money, how to talk to people, how to set goals and they earn money for their troop. And it can be a sizable amount of money. They earn badges for everything from customer relations to surpassing their goals. So as you can see, it's a lot more than just having icy cold Thin Mints in your freezer. Mmmm mmm, frozen Thin Mints. "You may remember the Mango Creme from last year? Well, it's been replaced by the Cranberry-citrus Crisp. I've tried it; it's very good. Of course, my personal favorite is the Caramel Delite. And as usual, we have all the classics. So, if I could just get your name and number..."
As she is poised with her pen in place on the order form. No monkeying around with questions like "Would you be interested in buying some Girl Scout cookies?" Nope, right to the jugular. And guess how many people said no thank you? None. Zip. Zero. Lofty goal attained! Our neighbors and friends came though and she ended up at 308. Whew! So, for the last week, I've had cases and cases of cookies all over my dining room, living room coffee table and in the entrance hall. Slowly but surely they are getting delivered to their rightful owners. Funny thing about this year is that people seem to be chomping at the bit to get their cookies. I've had several people email me "hey, I want my cookies." They're coming, they're coming, hold your horses. So, for all of you who did not pre-order, there is hope. For those of you who didn't order and are now jealous when you see your co-workers receiving their colorful little boxes, don't give up. You still have time. And, don't fight it. You want these cookies. You need these cookies. If you're in Columbia, our troop will be selling at the Walgreen's across from Whole Foods tomorrow from 12-3. Stock up on some classics, definitely some Caramel Delites and maybe even try out the Cranberry-citrus Crisp. Thanks for supporting Girl Scouts of America! The Main Street revival that so many of us have craved for years is finally beginning to happen. Mast General Store is attracting retail shopping back to Main St. Paradise Ice is cranking out the best ice cream known to man. Cantina 76 has opened a 2nd location there. It's starting. My dad had read about a little place just off the corner of Main and Taylor. He's been wanting to go check it out, so we headed that way. At first glance, one might think opening a cafe right next to the Oliver Gospel Mission might be an odd location. And frankly, if Main Street weren't finally coming back to life, I'd agree completely. But, this location may work just fine. Especially since they feature many vegetarian menu items and a large healthcare organization, owned by a health-conscious vegetarian, is renovating 3 buildings right around the corner on Main. Cali's Cafe is probably the smallest restaurant I've ever been in! It has 3 booths and a few stools at the window. But its smallness creates a friendly, intimate environment. Within 2 minutes of entering, we had been welcomed and introduced to the owner, her sister and her mom, who are all in the restaurant helping out. I posed my age-old question about the chicken salad...you know the one..."Does the chicken salad have celery in it?" Yes. Yes it does. However, the owner told me that she doesn't really care for it either so she chops it finely. She sent me a sample of the cranberry chicken salad to try. It was very tasty, but a little too sweet for me, so I chose to order one of the sandwiches. I ordered the "Redwood." I really liked the flavors of this sandwich, especially the brie. If you look closely, you can see the good ooziness of the cheese. My one critique of the sandwich would be that the meat was a bit scant. Just one more slice of turkey and one of ham would have given the sandwich the "heft" to stand up to the bread and the horseradish. Would I get this sandwich again? Yes, but with my suggestions. The sandwich was accompanied by some pasta salad. I must be honest. I got burned out on pasta salad at its advent...in the 80's. Yes, of course, I've had some pasta salads over all these years that have been pretty good, but for the most part, I'm over the whole pasta salad thing. Unfortunately, Cali's is serving exactly what I hate about pasta salad. Pasta with some bell pepper, carrot, whatever, drowned in bottled Italian dressing. Not a winner on any level. I'd rather have any other side on the planet. Even just simple chips would do. As you can see from the photo, this all came served on a styrofoam 3-sectioned plate. Styrofoam..well, I don't need to say much here. But, if you're going to use a 3-sectioned plate, be it plastic or china, there should be something in that 3rd section. Presenting a plate with an empty slot, well, it just screams "Something's missing!" And that's because it is. I mean, even just plopping a pickle there would solve this problem. But, please,make it a good pickle. So, it may sound like I'm all critical and $%&t, but I'm really just telling it like it is. And this is what it is...I like this little place. I like the wonderful, friendly and inviting family of women that run the place. I want them to succeed. Thus, my comments and suggestions. I hope you will check out Cali's Cafe. If people keep them going they will do well when the Main Street explosion happens, which I think is on our near horizon. Turns out the Broncos weren't the only miserable losers Sunday night. Like most of you, we got together with friends to watch the Big Game. Our friend Brian made jambalaya, which turned out really well. Nice and spicy. Neil made teriyaki wings and they all got eaten. But me? Oh no. 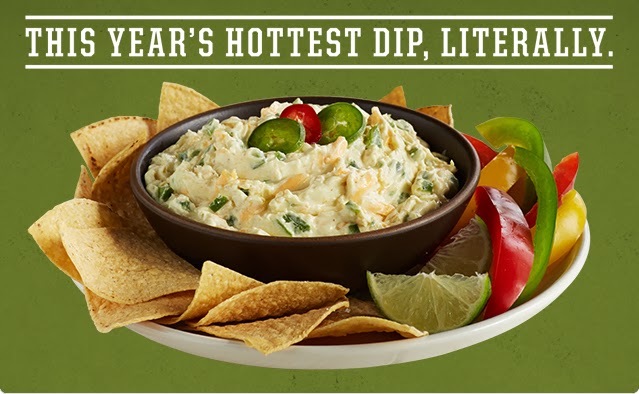 I made one of the worst party dips in modern history. I ripped it out of a magazine because the photo looked nice. I thought to myself, "Hmmm, Neil and I like jalapeno. Most everyone likes poppers. This will be perfect." Wrong, wrong, wrong. First, when I mixed the ingredients, it all got very yellow and mushy. In fact, Neil looked at it and thought I'd made egg salad. Second, the use of mustard was way over the top. I can appreciate the tang and tartness that the mustard would add. The acid makes sense when you're working with so much cheese, but this was just too much. Then, the jalapenos that I used had NO HEAT. So, all I could get from the peppers was almost like that raw bell pepper taste, which I don't happen to like at all. I added some pickled jalapenos and their juice to try to heat it up, but it just wasn't enough to do the trick. No one mentioned it, but Neil and I both sat there eating this stuff and I looked at him and said, quite simply, "I hate this." Fortunately, I don't have many flops come out of my kitchen, but this was one for the books! If you see this recipe, don't be tempted by the picture. Just look away and turn your attention to some queso instead. I've told you guys before how easy it is for me to get burned out on chicken. But, when you think about it, if you're a meat-eating person, it's hard to exist without chicken. Not only because it's so versatile, but because it's a very lean protein, which we all know is better for us than, oh let's say, fatty mutton from Kazakhstan. As a funny aside, I met a girl once who was performing an internship in Kazakstan...and she was a vegetarian. It was a very long year in her life. Back to chicken. As much as I love it and appreciate it, I can become bored with it very easily. This is one reason that I have a library of cookbooks to see me through these chick-a-bore times. Today, I hit one of those moments when I thought about dinner, pictured chicken and then nothing but static on the monitor. I went to the fridge and took inventory and came up with a stir-fry idea based on a recipe I've read about 401 times over the years. "Pacific Rim." This was a lovely stir-fry consisting of carrots, red bell pepper, broccoli and chicken flavored with a sauce of soy sauce, basil, a little curry powder, corn starch, and chicken broth. 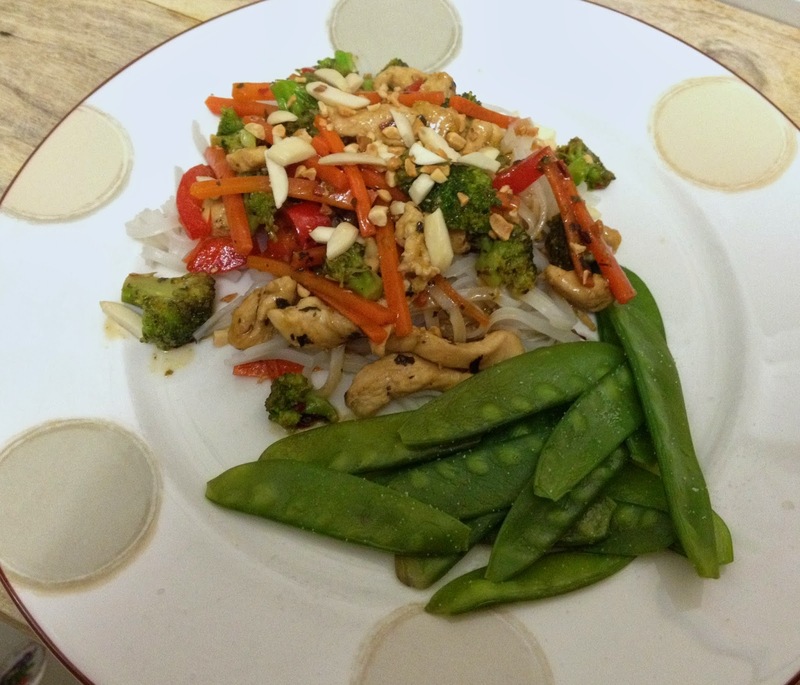 I served it over rice stick noodles and a side of pea pods (snow peas). I altered the printed recipe a bit, based on what I had on hand. The result was quite nice. I particularly liked the subtle combination of the basil with the curry and soy. I also included a smidge of crushed red pepper (only a smidge because of the wunderkind). It still may have been a bit on the spicy side for her tastes, but she ate her dinner without complaint. Well, that's not completely true; she wasn't crazy about the rice sticks. Those of you with kids know that if all they reject is noodles, you're doing something right!